In 1963, when South African native Rod Mandelstam graduated from the University of Miami, he left behind a heritage of tennis supremacy that has lasted over the years. Rod came to UM in 1961 as the reigning Wimbledon Juniors Singles Champion and turned down offers to play professional soccer in England. In his first year as a Hurricane he was an All-American selection and won the and won the NCAA Doubles Championship with partner John Karabasz. Over the next two years Mandelstam maintained the level of excellance promised by the first year. During his entire career Rod played in the No. 1 spot on both the singles and doubles squad, boosting a perfect record in doubles competition and dropping only two matches in singles comprtition. 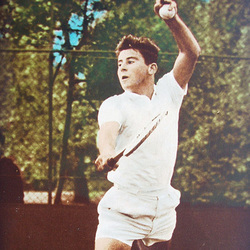 Upon graduation Mandelstam joined the professional tour and proceeded to win events in several countries, including several appearances in the winners circle at Wimbledon, the French Open and US Open.